The super awesome ladies behind 'The Moms' (aka the Mamarazzi®) invited Ascending Butterfly to a very special screening of Madagascar 3, where we got the chance to not only view the film, but also a Questions and Answers Session and Meet and Greet with Jada Pinkett Smith. We also got to try out the new Capri Sun Super V juice. There were rainbow afro wigs, moms drinking from Juice Boxes, eats and treats and I have to say it's one of the wildest screenings I've attended in awhile! As a former film critic (Bronx Observer), I've attended my fair share of screenings and press junkets for films, but this was definitely different! English: Alex the Lion, Marty the Zebra, Gloria the Hippo, and Melman the Giraffe are still fighting to get home to their beloved Big Apple and of course, King Julien, Maurice and the Penguins are all along for the comedic adventure. Their journey takes them through Europe where they find the perfect cover: a traveling circus, which they reinvent – Madagascar style. Spanish/Espanol: Alex el león, Marty la cebra, Gloria la hipopótamo, y Melman la jirafa siguen tratando de regresar a su casa en su adorada Gran Manzana y por supuesto, el rey Julien, Maurice y los pingüinos también participan de esta divertida aventura. Su viaje los lleva através de Europa en donde encuentran la excusa perfecta para mantener las apariencias: un circo ambulante, al que reinventan al mejor estilo Madagascar. El rey de Nueva York todavía desea con ansias regresar a su hogar y a su trono en el zoológico de Central Park. Esconderse en un circo ambulante europeocon el resto de sus compañeros del zoo podría ser finalmente la manera devolver a la Gran Manzana, pero nada es tan fácil como parece cuando los miembros del grupo se convierten en los “Más buscados de Europa”. 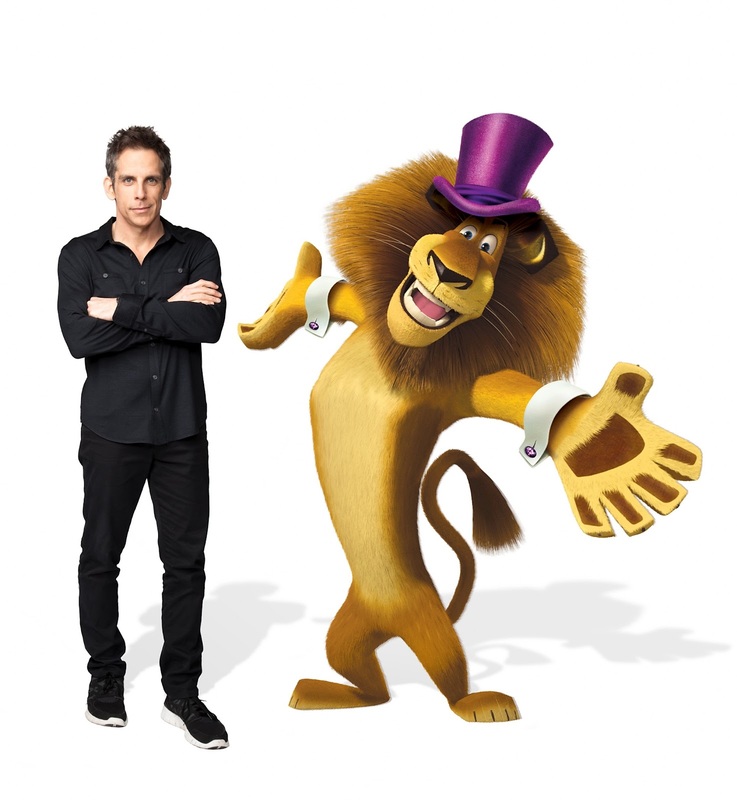 Although he found his herd in Africa, Marty isn’t willing to leave his best friend Alex’s side. The opportunity to join the circus gives Marty the shot of adrenaline he needs…he just didn’t realize he is the one being shot…out of a cannon. A pesar de que encontró a su manada en Africa, Marty no abandonará a sumejor amigo Alex. La oportunidad de unirse al circo le da a Marty el disparo de adrenalina que necesita... solo que no se dio cuenta de que él también sería disparado… desde un cañón. 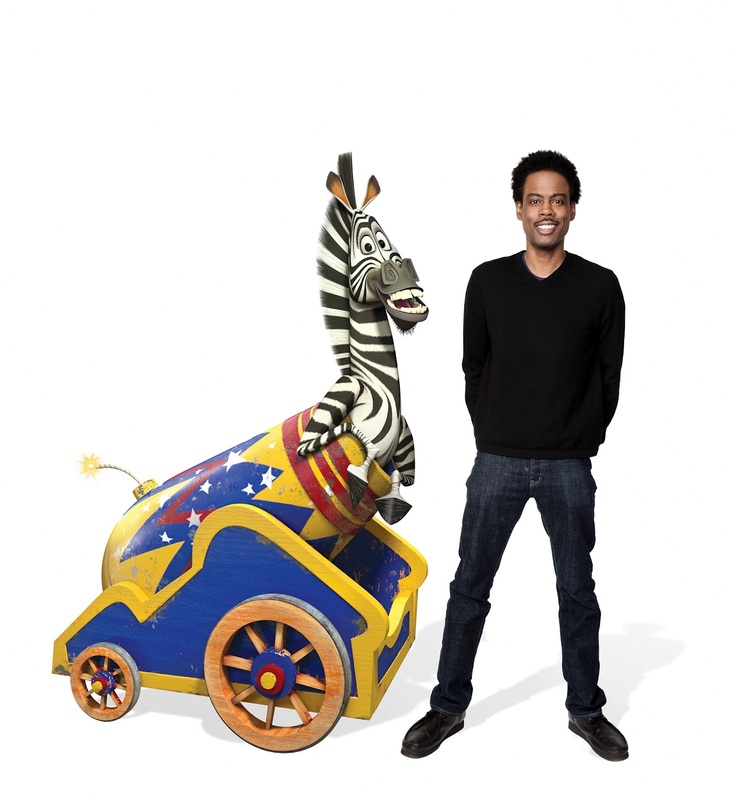 Did you hear the one about the hypochondriac giraffe who finally found love with a hippo? 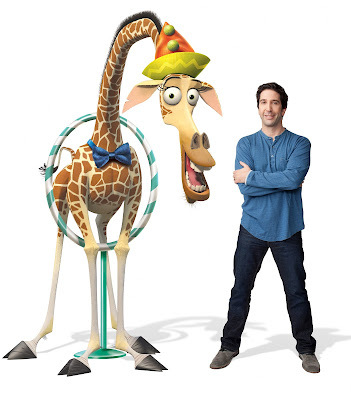 Melman’s dreams are realized as he and Gloria figure out how to balance it all…on the circus high wire! ¿Oíste hablar de la jirafa hipocondríaca que finalmente encontró el amor en una hipopótamo? Los sueños de Melman se vuelven realidad cuando él y Gloria descubren cómo equilibrarlo todo… ¡en la cuerda floja del circo! 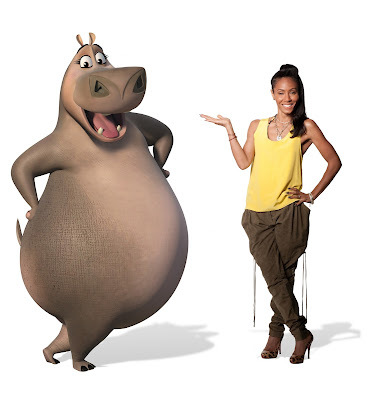 The sweet, sassy and adorably plump hippo-next-door found love in Africa, and now she is ready to take things to exciting new heights with the rest of the Zooster gang. Who says an oversized, heavy hippo can’t master the high wire act? La dulce, atrevida y adorablemente regordeta hipopótamo encontró el amor en Africa y ahora está lista para llegar a nuevas y emocionantes alturas con el resto de la pandilla del zoológico. ¿Quién dice que una hipopótamo extra grande y muy pesada no puede dominar el arte del equilibrio en la cuerda floja? 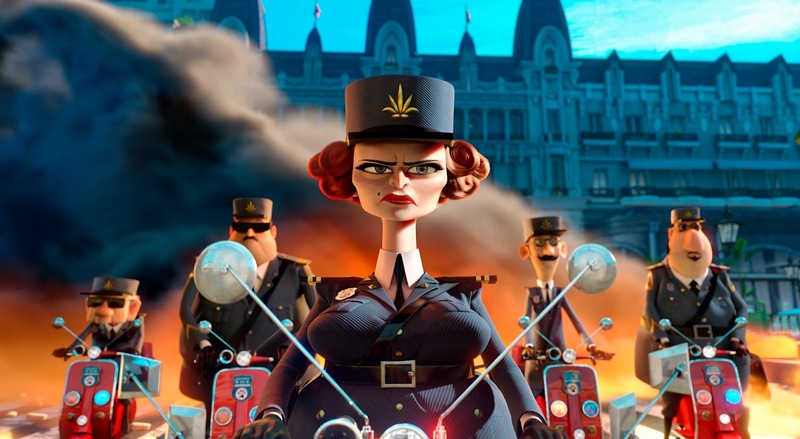 Stealthy and adventurous, Skipper, Kowalski, Rico and Private sneak through Europe on a mission. They cook up a clever plan to help the Zoosters hijack a European traveling circus and turn it into a true three ring adventure. Sigilosos y aventureros, Skipper, Kowalski, Rico y Private se escabullen através de Europa con una misión. Urden un plan inteligente para ayudar a los animales del zoológico a secuestrar un circo ambulante europeo y convertirlo en una verdadera aventura de tres pistas. Right after the screening, Jada Pinkett Smith walked into a surprisingly silent room and teased us all about how quiet it was. It didn't remain that way for long, that I can tell you! There were tons of questions for her - ranging from acting to motherhood and she answered thoughtfully, openly and with a great sense of humor. I can certainly remember from Press Junket's how hard it usually is for an actor to maintain their enthusiasm after answering the same question for the hundreth time, but Jada approached each question with thought and her passion for her craft, her family, and for life really did shine through. I loved that she affirmed the importance of taking time for yourself. How feeding your passions fuels your spirit. She said that 'We need to feel alive so we can give passion to those that we love' and I couldn't possibly agree more. I find that on days when I don't take time for myself, where I give 100% to everything and everyone else, and leave nothing more for myself, I get burned out, and that's not where I want to be! As soon as we arrived to the screening venue, here is the smiling face that greeted us with our choice of Capri Sun Super V flavor! 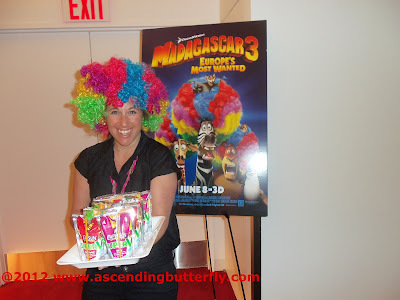 Kraft Foods recently launched Capri Sun Super V, and they were at the Madagascar 3 screening and provided us all with samples! Picture a room full of bloggers drinking out of their Capri Sun Pouches! Left: Ascending Butterfly holding her Fruit Punch Flavor Capri Sun Super V! Each pouch provides ½ cup fruit and vegetable juice, which is one combined serving of fruits and vegetables, according to the U.S. Dietary Guidelines (¾ from fruit juice, ¼ from vegetable juice). It is also fortified to be a good source of fiber and antioxidant vitamins A, C and E. Recommended Daily Intake = 4 servings of fruit and 5 servings of vegetables in a 2,000-calorie diet. Be sure to make most of your fruits and vegetables whole fruits and vegetables. 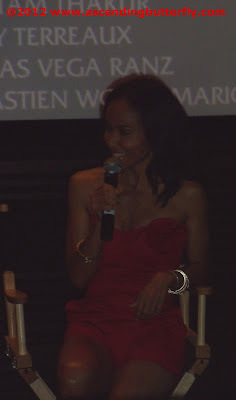 I greatly enjoyed the opportunity to be a part of the Q&A with Jada Pinkett Smith, she seems to have a strong appreciation for her blessings in life and takes her most vital role, that of being not just a Mom, but a hands on mom that teaches her children to be independent, caring and grateful individuals very seriously. I enjoyed this movie, the penguins always make me laugh and it had great 3D special effects (happy to see that the 3D complimented the film), it had great pacing, and sneaks in great lessons for the little ones without boring the adults! And as a former event organizer I have to also say I love the way the screening was organized, and the details and touches that went into it. As a Duane Reade VIP Blogger and Brand Ambassador I have to point out there was a Duane Reade mention, which made me smile! And of course I wouldn't be doing my job as a butterfly loving blogger if I didn't point out there was a butterfly sighting in this movie! And you know that always makes me smile. 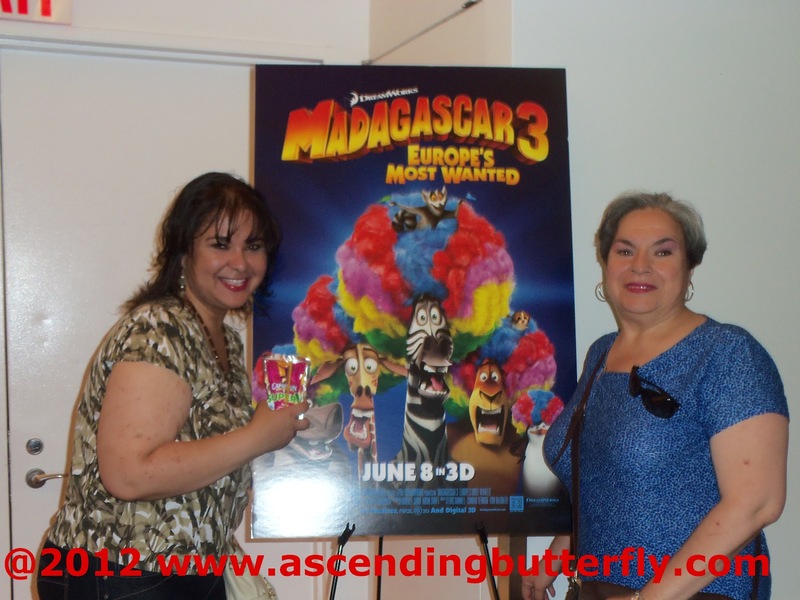 I still have some more photos from the screening, but I'll share the rest as this week's Wordless Wednesday! FTC Disclosure: This is NOT a sponsored post. I attended a screening as a member of the digital press and did receive a gift bag.